On the lake of the same name with the Alps as it’s backdrop, you will find the small but charming city of Zug. 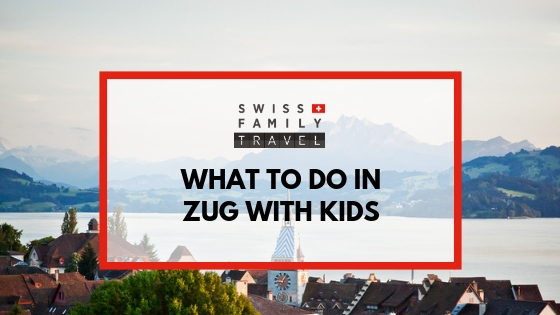 Probably more famous as an international corporate headquarters haven, because of famously low taxes, than as a family friendly place to visit, Zug and the surrounding area has a lot to offer families and anyone who loves the great outdoors. Located between Zurich and Luzern, Zug is well positioned on the famous Swiss train network, and is great not only for exploring things locally but as a base to explore further afield. It's a wonderful place for those who want to base themselves in a quieter city with the benefit of being able to easily escape to the mountains or further south to the beautiful Swiss-Italian region, known as Ticino. If you come in the summertime, a swim in the lake at the Badi is a must. What on earth is a Badi? Badis are local swimming areas at the lake and are the place to cool off in the heat of the summer. Entrance to the Badis in the city of Zug are free of charge, while Badis in other villages may charge a nominal fee. Our favourite Badi is the Strand Bad in Zug, just a short walk along the lake from the centre of town. At that Badi you’ll feel like you have been transported away on holidays as you enjoy lunch or a glass of wine at tables set under big shady trees. In addition there is a small beach where the kids can play for hours in the sand, and even 1,3 and 5m diving towers towering over the lake (for the more adventurous souls). The self service restaurant is great and I highly recommend the Fischknusperli Fitness Teller (Fried fish with salad). Feel free to pinch a couple of chips from your kids, they are delicious! Zug, the cherry capital of Europe! Enjoy sweet delicious local cherries in early summer. Zug is most famous for its plentiful, juicy, and sweet black cherries—and if you are lucky enough to travel through Zug in the middle of June, sampling cherries needs to be on your list. Saturday the 8th July 2017 is “Cherry Day”; and its here you’ll find a festival dedicated to cherries on the Landsgemeindeplatz. If you are here in early spring, not to worry, the cherry trees are still a sight to behold with the bountiful and beautiful blossoms covering the trees. If you’re lucky enough to be here in season, I encourage you to grab some cherries and farm fresh deliciousness from the local farmers market on a Saturday morning (also on the Landsgemeindeplatz), take a stroll along the lake, and find a shady picnic spot to sit down and enjoy them. From April till October (check website for exact opening times) you can rent a pedalo (pedal boat) at the Landsgemeindeplatz. From there you can set off to explore the lake of Zug as far as your legs will take you. It’s a fun way to see the town of Zug from a completely different perspective. You’ll notice that Zug has some of the best sunsets, so why not rent one around sunset, sit back and enjoy the breathtaking scenery of the shores of Lake Zug. If all of that pedaling gets you thirsty, you can hop off your boat and enjoy a drink at one of the many outdoor terraces of the restaurants which line the lake. You’ll be able to sip and watch your kids run in the square, and if they enjoy birds, they can have a look at the bird enclosures at the edge of the lake. Grab the key to the Zytturm landmark and explore the clock tower yourself. Located in the old town of Zug, this iconic tower is the entrance to the old town and was originally provided fortified access to the town when it was built in the 13th century. It’s present shape was constructed in 1557 to include the watch chamber and a astronomcical clock to include the weekdays and months. You can visit the clock tower by collecting the key from the shop Wunderbox located behind the tower. When Wunderbox is closed, the Restaurant Intermezzo can help you out, and on a Monday you’ll find the key at the local Bibliothek (library), just a few blocks away. Afterwards why not enjoy a crepe at Intermezzo? Intermezzo not only serves the most delicious crepes, but also does a fantastic job by providing jobs to less abled people. I love to create my own crepe filling with parma ham, Mozzarella and rocket—and on days that I’ve worked hard to climb the clock tower I’ll treat myself to a sugar and cinnamon crepe for a sweet finish. In December get lost in a magical fairy tail land right in the middle of Zug. On the 10th December 2017 Zug will turn into a Fairytale land with more than 30 locations around the old town hosting story tellers who entertain the young and young at heart. For that day, Zug old town goes “car free” and you'll be able to walk all around and through the streets with their beautiful holiday decor. You will find many colorful characters and perhaps also a Sami Chlaus (Santa Claus) or two. The festival finishes with a parade through the town and fireworks at 5.30pm. If you have your heart set on a particular event get there early as there is almost always a line. Get your Christmas spirit on by grabbing a Glühwein, homemade ginger bread and some hot chestnuts and wander through the streets like a local. When was the last time you put on ice skates? From October until March the outside (but still under cover) ice skating field is open at the Bossard Arena. Open daily, you can enjoy the fresh air while ice skating. There are high quality skates and skating aids to rent on site. Home also to the local EVZ Ice Hockey team, you could combine some afternoon ice skating along with an evening visit to watch a game (check here for schedule). If all of that gets your appetite going there are a few options. Next to the rink is a friendly little pop up stall with the usual suspects: bratwurst, rolls, drinks, and beers. Or, head upstairs to the 67 Sports Bar for a great burger. If you’re there on a Wednesday you’ll find all-you-can-eat spareribs night. Switzerland implores you to slow down and marvel in it’s natural beauty. There is a good reason Switzerland is at the top of the list for its quality of life—The Swiss know how to stop and enjoyLocals sit for hours in the cafes chatting away over a cup of coffee or glass of prosecco. Evenings are for enjoying the sunsets over the lake of Zug and taking long walks. Enjoy not being in a hurry to get somewhere and take a stroll at sunset along the lake and find a bench to sit back and take in the show. These are our favourite things to do in Zug. Have you visited before? What would you add to the list?